The former Allied Textile Printing (ATP) site, known as the birth place of the American industrial revolution, at the Great Falls National Historical Park is being rehabilitated using $4.23 million. As part of the Quarry Lawn project, the city will stabilize the threatened ATP River Wall, create a river walk along and on top of the River Wall, and build a “great lawn” across the quarry for passive recreation and event space. 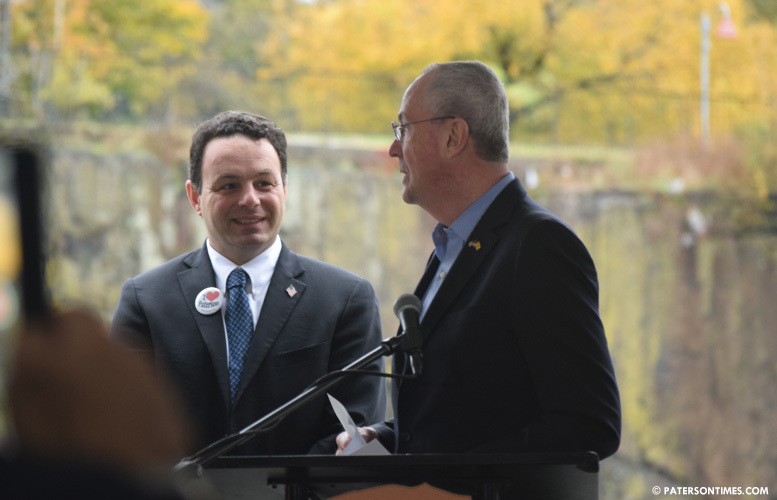 Sayegh was joined by governor Phil Murphy and other state, county, and federal officials in announcing the launch of the project at Overlook Park on Friday morning. “Enhancing the natural beauty of Paterson Great Falls, and celebrating the rich history of our state and the Passaic River through the Quarry Great Lawn, is a significant achievement for this region,” said Murphy. Sayegh was one of Murphy’s early backers, something that was on the governor’s mind at the event. “We met when it was cold, dark, and lonely for me,” said the governor. He was an unknown, rich, nobody who shared a similarity with the disliked ex-governor Jon Corzine, who New Jerseyans booted out of office in favor of Chris Christie. Both Corzine and Murphy worked at Goldman Sachs. The state’s Green Acres Fund and the National Park Service are each providing $1.8 million for the project. New Jersey Hazardous Discharge Site Remediation Fund is contributing $450,000 for environmental remediation at the site. The City of Paterson is contributing $150,000 and the Passaic County government is pitching in $30,000, according to municipal officials. Project is slated for completion in mid-2020, said Gianfranco Archimedes, director of the Historic Preservation Commission. He situated the Quarry Lawn, which is adjacent and contiguous with Overlook Park, downstream of the Great Falls, for the almost 100 people in attendance. The 6.5-acre site had 30 structures that have been damaged by a series of fires. Attendees received a tour of the closed-off area after the announcement. Once the project is finished, visitors will be able to go on a river walk that starts at Overlook Park, eventually forming a half-mile loop trail along both north and south banks of the Passaic River crossing over at the historic West Broadway bridge and the Wayne Avenue bridge. The project is the latest step in the process of building the Great Falls National Historical Park, designated in 2009. Previously, municipal officials celebrated the completion of the Mary Ellen Kramer Park and the Overlook Park. The park attracted 308,000 visitors in 2017, according to the National Park Service. “We see this becoming a focal point of our economic resurgence,” said Sayegh.